It is a latest trend the one of making kids inventors of their own toys by helping them to make real their ideas, inviting them to start creating lifelike structures that they can really use. Suppose that you get a great idea but, you do not know how you can transform it into something real.. Nowadays our society and our day to day, is made possible by all kinds of creative and technical inventions. So, as design and technology plays an important part in our lives, it would be interesting to consider it in education. This kind of learning process exceeds the practical aspects of design and technology, helping kids to find solutions by developing their creativity and perseverance. It is a fantastic way to encourage creative thinking in children. Infento derives from the latin phrase “infinite makes” and has been created by the designers Spencer Rotting and Sander Letema as the “world’s first real constructible rides”. Having in mind that everyone can have a great idea, Infento comes in to help children to learn how to convert their ideas in something real. Very often, construction materials are miniaturized or you need expensive or complex tools and materials. That’s why Infento has developed a modular construction material that is strong, easy to use and incredibly versatile. Infento has developed an education package that ensures that pupils can play and learn in an investigative way using design and technology, real materials and techniques that are used in everyday life and are available for everyone. The education package combines creativity, technical and “making” feel, and fun while learning in a unique way. The Infento Education Kit is especially designed for schools. It is in fact a perfect solution to bring pupils of all ages in touch with a scientific and engineering mindset, in the spirit of STEM education. Children build structures that are close to their experiences and make use of real materials and techniques. The design is developed in such a way that parts can always be reused for new structures and during the time materials can be transformed into different shapes and structures. This is the very feature I appreciate because it is a smart way to reduce production of new products and yet keep the emotional link with the toy even if it took new shapes. Infento can be used for multiple levels for primary education, practice education, lower vocational education and lower general secondary education. Children of 3-6 years old can start with the first level building structures based on animals. In this level there are just needed 2 types of bolts, 1 type of nut and 2 connectors. 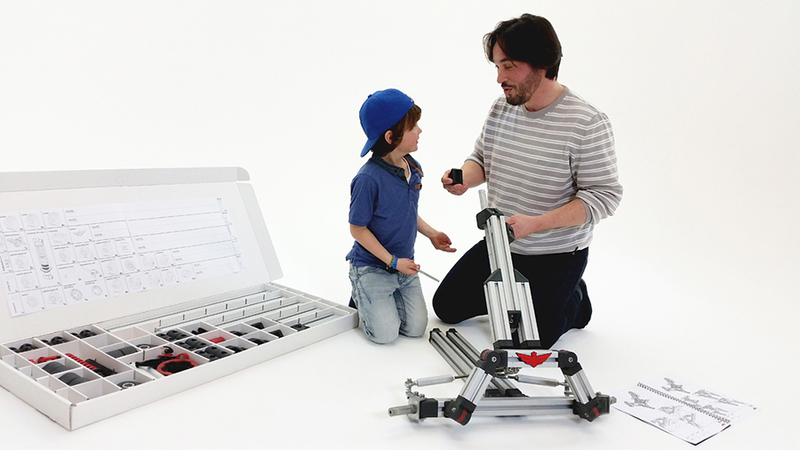 In the next level, older pupils can challenge themselves using a limited number of connectors and bolts to come up with something themselves and build it. In the third level, pupils can build the called “key objective structures”, specifically focused on driving, braking and steering. These structures are also well suited for activities in small groups of 4-6 pupils. The highest level is your own imagination. In the next level children can build four different large models (rides). Learning with Infento means that pupils get to cooperate a lot, there are cross-curricular elements such as calculating, size evaluations and reading comprehension. Finally, in the last level pupils can build their own structure, they can develop anything. It is the moment to challenge themselves starting with an idea and then turning it into a lifesize creation. At this point, Infento offers the possibility to use the 3D software Sketchup, so pupils can eventually even use a 3D printer to print their own add-on materials. Through the different levels children start learning technical skills, thus making kids inventors of their own toys, starting by building basic structures and finishing building 18 real vehicles forms. Infento also allows families to buy just a bicycle for children once, instead of buying a tricycle, then a bike with training wheels and so on. Helping in this way children learn to walk, bike and move.